Recycling has become a very big part of our daily lives. However, studies show that most people don’t know that there are many household items that cannot be recycled. Understanding what items can and cannot be recycled helps us to make better purchasing choices in the future, and can help us to understand the benefits of re-purposing and re-using such items to keep them out of our landfills. #1 – Styrofoam: Avoid using Styrofoam products whenever possible including cups, disposable plates and packing materials. These items are notoriously bad for the landfills and for our environment. #2 – Plastic Lids: While some water bottle lids are now made of recyclable materials, the small plastic lids that you find on top of soda pop bottles, water bottles and other recyclable items are made of a completely different materials than the bottles themselves and have a different melting point. #3 – Plastic Hangers: A blend of different plastic types are used to create plastic hangers, making them difficult to break down in the recycling process. #4 – Mirrors: Most people aren’t aware that mirrors contain chemicals that cannot be mixed with regular glass during recycling. #5 – Food-Contaminated Containers: This includes pizza boxes, carry-out food containers – anything that has come in contact with food. The grease and oil that are found in these foods can contaminate the entire recycling process. #6 – Shower Curtains and Curtain Liners: Because shower curtains are made using a PVC-base product, shower curtains cannot be broken down and used again in the recycling process. #7 – Tires: When melted tires emit a toxic gas that is dangerous to humans and the environment. Your best bet is to re-purpose tires because they just won’t break down like other materials. #8 – Ceramic: When ceramics are recycled with glass they produce an unsellable, unusable product. Ceramic products don’t melt down like other similar materials. 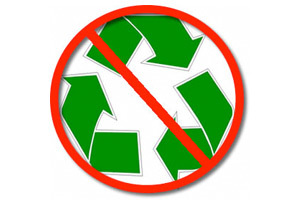 Additionally, hazardous materials such as pesticides, light bulbs and paint cans cannot be recycled. Check your local city or community bulletin board for information about quarterly or annually hazardous waste disposal collection or visit your local waste and recycling center for information about where to take such items. Sometimes the best solution is to find creative and unique ways to re-use or re-purpose these items that cannot be recycled. Old car tires can make a great outdoor planter because the rubber in them naturally keeps weeds and pests at bay. There are some businesses that even shred old tires and use the end product as rubber mulch in landscaping or at the base of playground equipment in parks. Old computers and electronics that are still operational can be sold on websites such as Craigslist.org or eBay.com if your local recycling center cannot take them. Mirrors, tiles, ceramics and other non-recyclable materials can be used to create collages, artwork and other decorative pieces. The only limit to re-using and re-purposing items is your own imagination. When you purchase new items it is important to think about what you will do with them when you no longer need them. Can the item be recycled? Will it sit in a landfill for hundreds of years? Can you donate the item to someone else who can use it? It is important to always purchase recyclable, eco-friendly items whenever possible. If you live in the Southern New England area, bring your recyclable materials to Mid-City Scrap Iron & Salvage in Westport, Massachusetts. Call toll-free at 1-800-334-4789 or locally at 1-508-675-7831 for more information on recycling household items. ← Create Your Own Recycling Center at Home!